Hopped beer was not only widely available during the period of the Civil Wars but had ousted unhopped ale in popularity. The invasion of beer and its eventual victory over English ale had its beginnings as early as the 13th century. In 1289 for instance, a Norwich ale-seller was charged with illicitly selling ‘Flander’s beer’. By 1400 Winchelsea was importing beer and soon large quantities of hops were being landed to cater for the new taste. Most beer was brewed by foreigners, Flemings and Dutchmen particularly. This lead to some friction and in 1436 Henry VI intervened to protect the London beer brewers. By the end of the Middle Ages, beer was widely drunk in southern and eastern England but had made less of an impact on the conservative tastes of the north. retail prices of beer and ale down when the cost of malt to the brewers was rising. The quantities suggest that beer and ale prices rose more slowly than other prices in the first half of the 17th century; thus drink became comparatively cheap. In a society as yet untouched by coffee or tea, beer drinking was a normal part of the daily routine from breakfast to supper. Consumption obviously varied from individual to individual but two to four pints a day was probably normal. Much of this would have been ‘small beer’, brewed from the residual mash left after the first brewing. It was watery and contained little alcohol but the very fact that it had been boiled rendered it a safer drink than well-water. In the 1550’s a writer declared “water is not wholesome sole by itself for an Englishman” and many no doubt would say Amen. Drunkenness, however, was an increasing social problem, even allowing for the exaggeration of preachers. The rise of beer played its part in this, being cheaper than ale but just as intoxicating. In 1620 a French physician observed “while Englishmen dranke ale they were strong, brawny and able men and could draw an arrow an eli long; but when they fell to wine and beer they were found to be impaired in their strength.” (Maybe so, but still strong enough to give a drubbing to the French!) By the late 17th century the words ‘ale’ and ‘beer’ were being used indiscriminately to denote hopped malt liquor, the original distinction being lost. By the time of the Restoration the triumph of beer was complete: it had virtually replaced ale as the national drink of England. we do, we should try to keep our enjoyment ‘in period’ as much as possible. 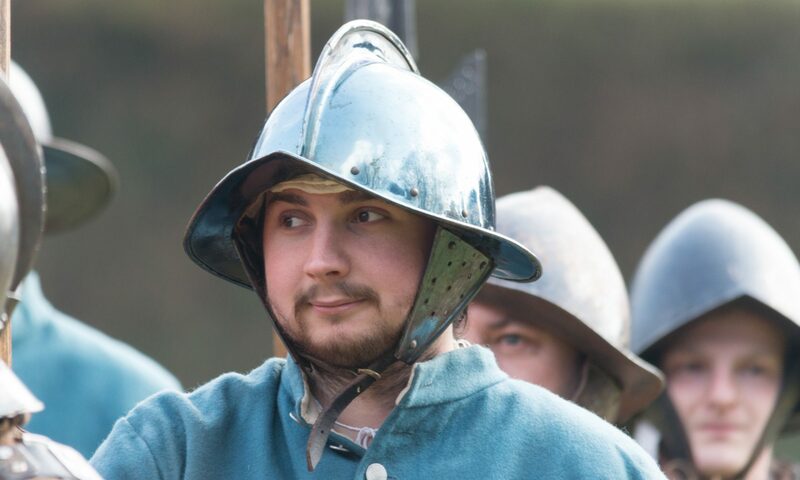 A common misinterpretation of an English Civil War Re-enactor is seeing a Victorian style pewter tankard hanging from there belt or girdle. There is no picture in existence, showing drinking vessels being worn by a belt, other than a print of a caricature, of The English Irish Soldier. A character representing that the English Irish Soldier would rather eat then fight. Pottery was very common in the 17th Century. The pot called, in the 1640’s, a ‘Bellarrnine’ must have been the best known vessel of the period. They seemed to be the can of fizzy drink of the 17th century. It is so distinctive and curious looking that it seems a must for re-enactors. Bellarmines came in a great variety of sizes, shapes and never really the same colour as each other. The cheaper imported examples often wry necked and kiln scarred, were probably intended for use as drinking pots. Ranging from 4 ins, to 22 ins, high and usually made of salt-glazed earthenware. They had many uses from household storage to drinking pots and were even used for the storage of acids and mercury. Bellarmines had a globular body with a long vertical neck with one lug (ring), a feature of them all was the face of the chap in question, ‘Bellarmine‘, on the bottle neck. Complete with thick curly beard and scowl or drunken idiot grin, believed to have been originally an effigy of the Roman Catholic Cardinal named Bellarmino. The only disadvantage of a pot as opposed to pewter is the fact that it will break. Of course you have to be a little more careful but it’s worth it. Another nice change from the usual is a leather cup or bottle, a coopered Tankard or a good cup of horn is fine.